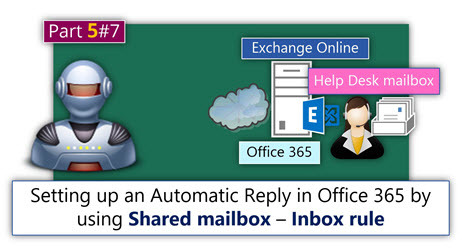 In the current article, we review how to implement a configuration of Automatic Reply by using Exchange mailbox rule. The mailbox rule engine is part of any Exchange mailbox. 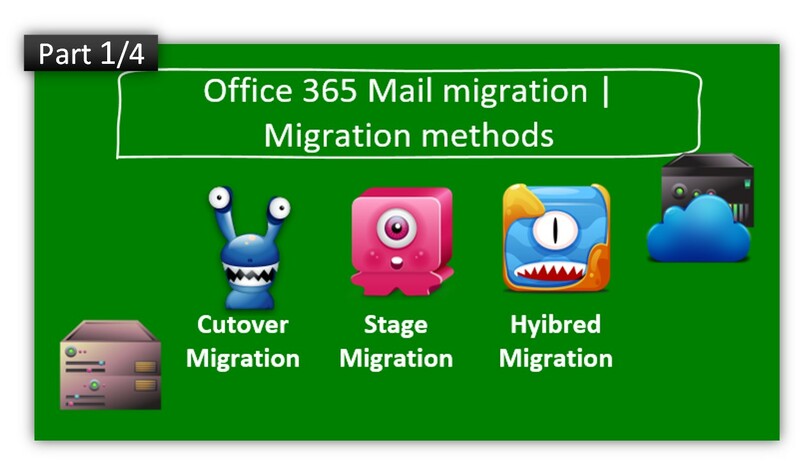 In our specific scenario, we will use a Shared mailbox that will serve a “service mailbox” for our Help Desk team. The Help Desk team, need to have a “department mailbox,” which will be shared between the Help Desk team members. The Help Desk shared mailbox will be configured to automatically reply with a predefined E-mail template to the organization users’ requests. 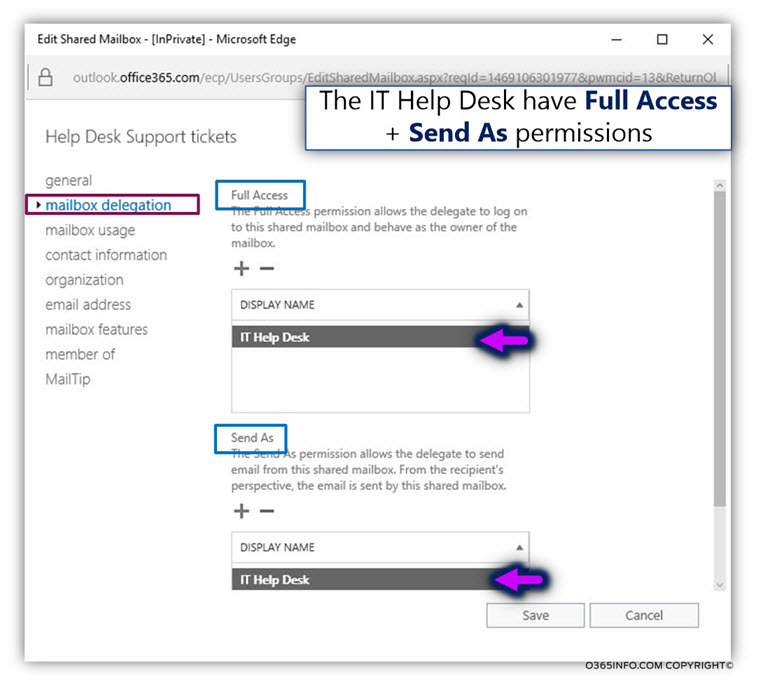 Each time that organization user needs to open a ticket for help \ service request, the user will address the Helpdesk team by sending E-mail to the “Help Desk” mailbox. with a predefined E-mail template (Automatic Reply), notify the organization user that his request was accepted and that soon he will be contacted by the Help Desk. Why use a shared mailbox and why using Automatic Reply mailbox rule? The Help Desk mailbox is not a “user mailbox” but instead, a mailbox that will be shared between couples of “owners” (the Help Desk members). In the Office 365 environment, we can create and use Exchange Online shared mailbox without the need for purchasing a license. 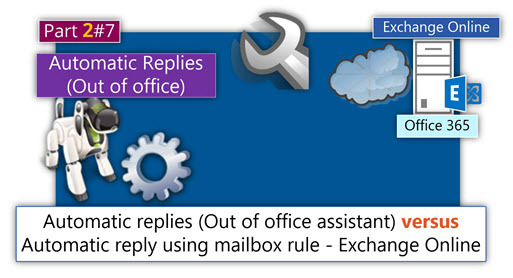 In our scenario, we need to implement the Automatic Reply by using mailbox rule and not by using “Automatic Replies” (Out of office assistant). The reason for using mailbox rule is because, in our scenario a specific user can open many service request tickets, and we want to send to automatic E-mail reply, for each or the service request. the E-mail response will be sent to each sender only one time. Thank you for contacting o365info Support! Your request has been submitted, and a Technical Support Engineer will be contacting you shortly. 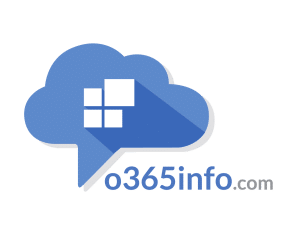 While you’re waiting, check out the o365info Help Center! Thank you for contacting us, and we look forward to helping you. In our example, we will create a new Shared mailbox using the Exchange Online admin interface. 3. Configure a shared mailbox “owner” (Full Access permissions). 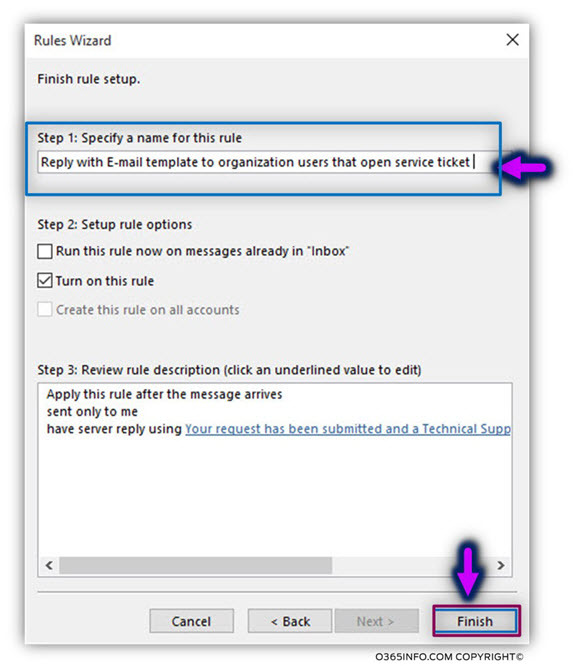 The process of creating an Automatic Reply mailbox rule is implemented via the Outlook client. 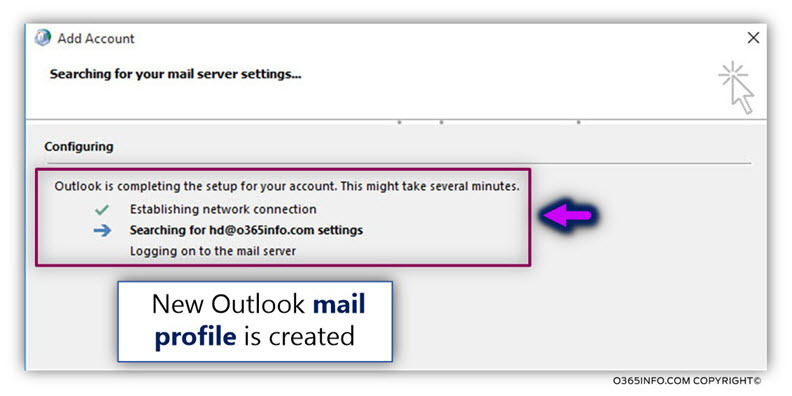 To be able to create a new Outlook mail profile, we will need to use a little trick, in which we provide the identity of the Shared mailbox (the E-mail address of the Shared mailbox) but instead of providing the credentials of the Shred mailbox, we will provide the credentials of “other” Office 365 users who have Full Access permissions on the Help Desk shared mailbox. 4. 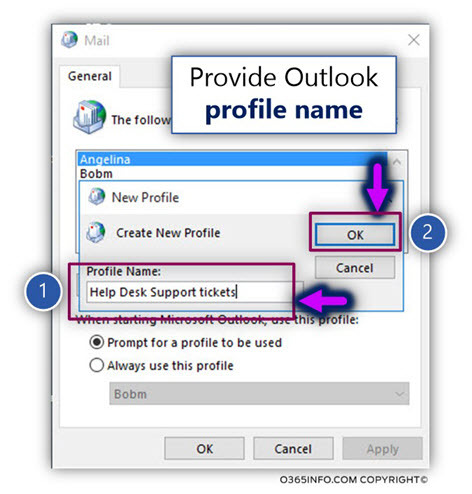 Create a new Outlook mail profile that will be used to login into the shared mailbox. 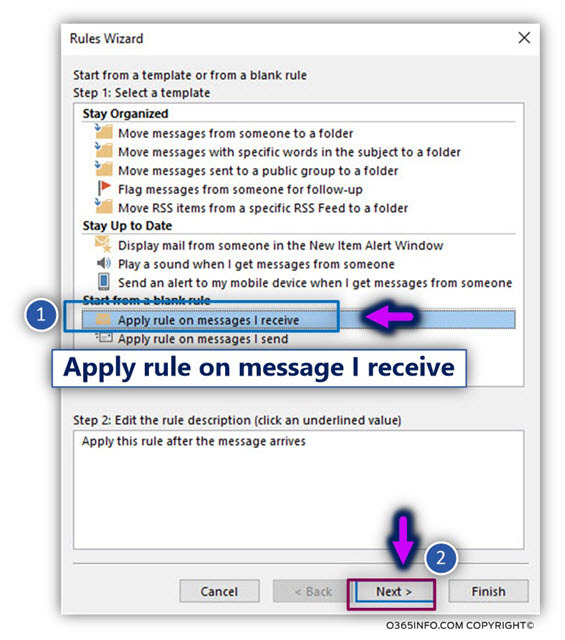 The tasks of creating an Automatic Reply mailbox rule (described as – have server reply using a specific message) can be implemented only when using an Outlook mailbox rule wizard (the OWA mail client mailbox rule wizard includes fewer options). 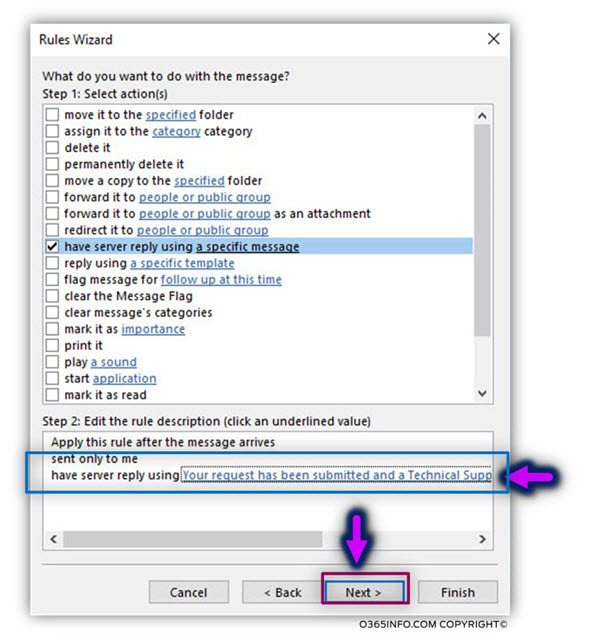 Implement the required steps for creating the Automatic Reply mailbox rule. In this step, we verify that the Automatic Reply mailbox rule operating properly – respond by sending the predefined E-mail template, etc. 7. 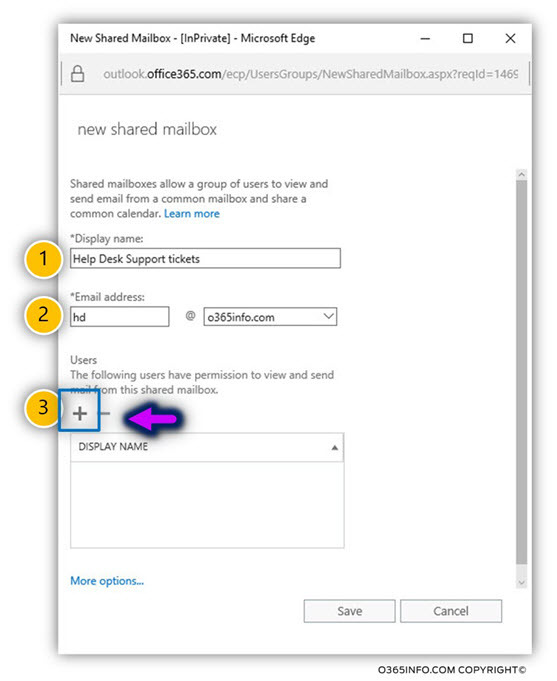 Optional – create a security group and assign the required permissions to the security group on the Shared mailbox. I described this step as optional because, in reality, it’s not a mandatory step that we need to complete. Instead, this is recommended steps or best practice step. We need to create a special “service mailbox” for the Help Desk department. 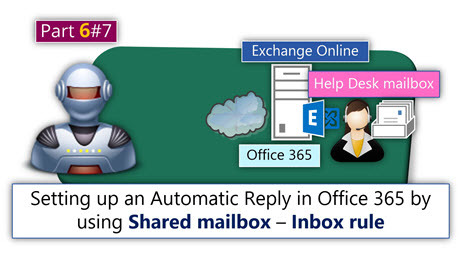 The shared mailbox will implement the procedure of automatic respond, for each user that sends a service request. The Shared mailbox will be used for scheduling a meeting with organization users, save contacts information, and so on. Each of the Helpdesk team members will have Full Access permissions to the Shared mailbox. 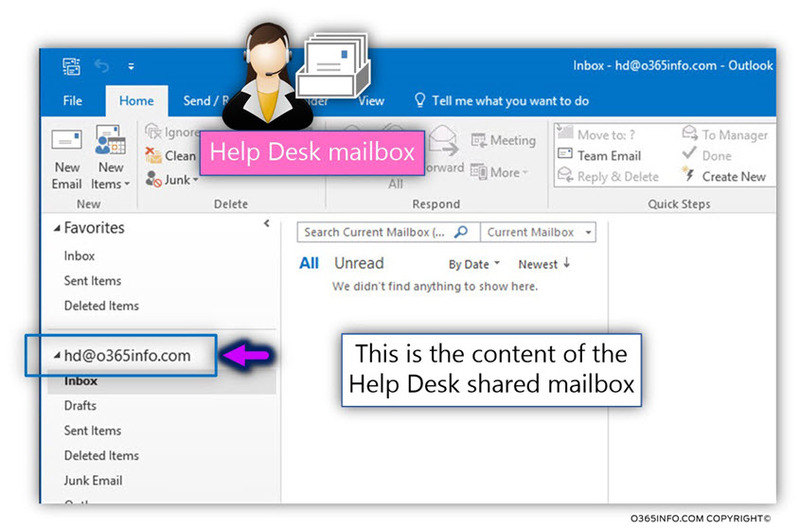 Each of the Helpdesk team members will have Send As permissions to the Shared mailbox. The demonstrating that includes step by step’s description and screenshot, is implemented in Exchange Online (Office 365 based environment). It is important to mention that – most of the “actions” and the “interfaces” are identical to Exchange on-Premises implementation. 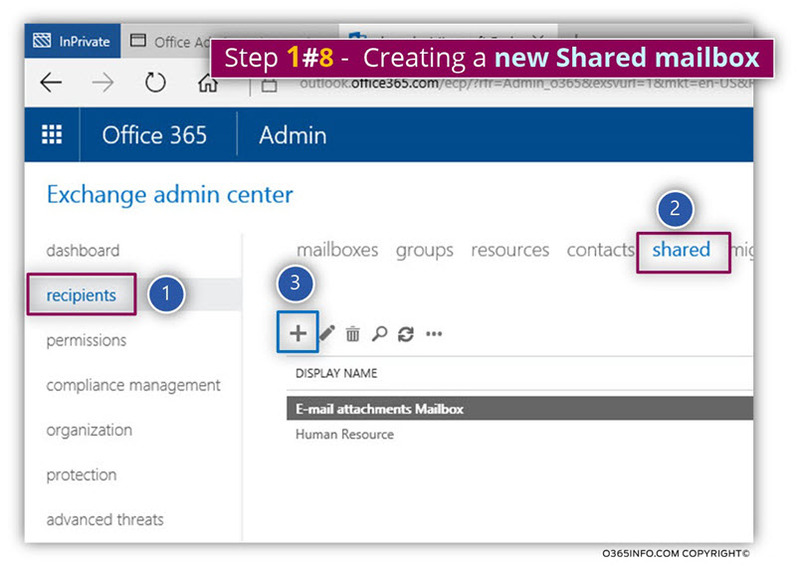 Creating a new Shared mailbox using the Exchange Online interface. Assign the required management permissions to the Help Desk ticket shared mailbox.” We will assign Bob (Bob is the IT manager) the required management permissions, so he will be able to create the required Automatic Reply mailbox rule. In the next article, we will review the way that we assign permissions to the Help Desk group members. In the *Email address box, type the alias name of the Shared mailbox ([email protected] in our example). Select the plus icon for adding user with the required permissions. In Exchange Online environment, the shared mailbox wizard will automatically assign Full Access permissions + Send As permissions to the users that we select from the list. 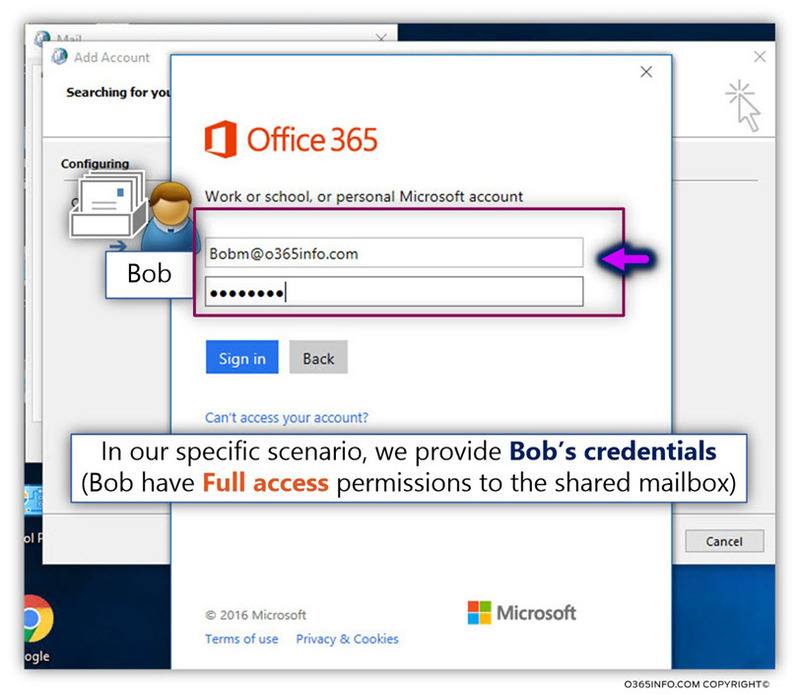 In our example, Bob will have Full Access permissions to the Help Desk shared mailbox. 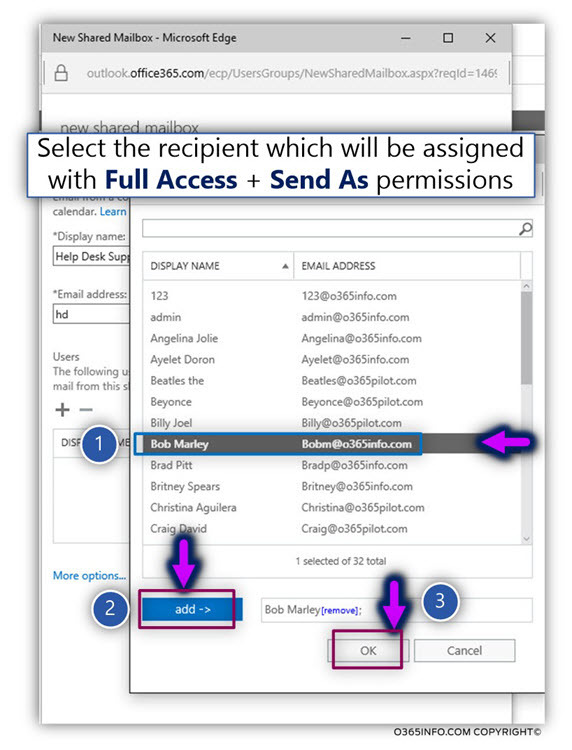 Select the required recipient name (In our example, Bob will have Full Access permissions to the Help Desk shared mailbox). 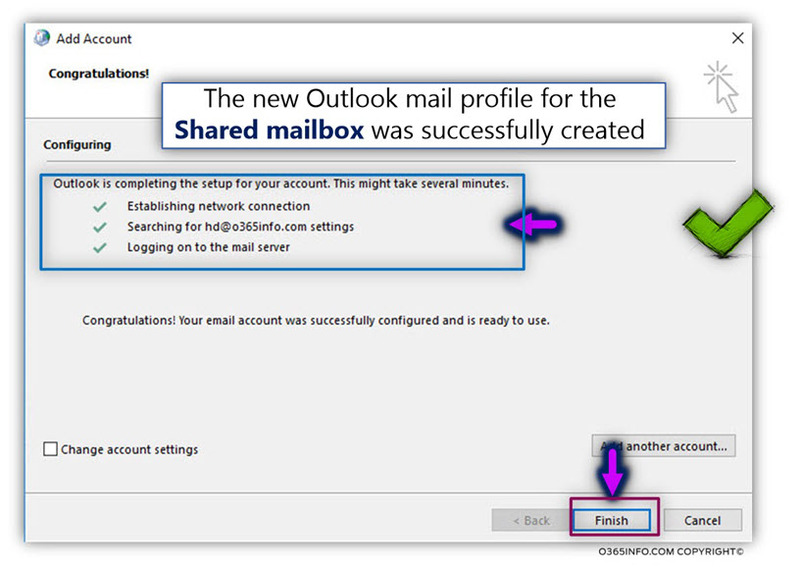 In the following screenshot, we can see that a new Shared mailbox was successfully created. 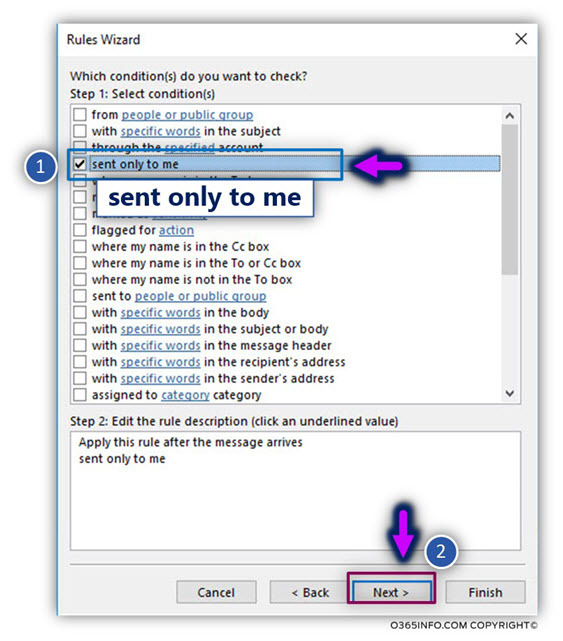 The Automatic Reply process is implemented by creating a mailbox rule. 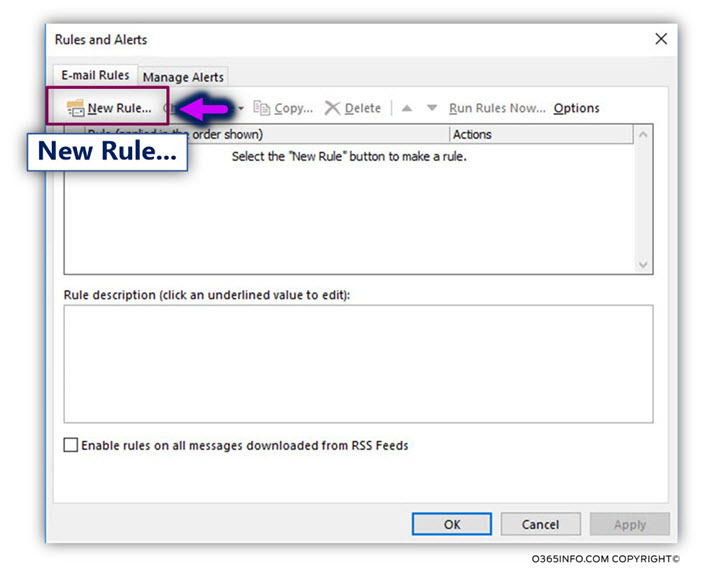 To be able to create the required mailbox rule, we will need to use the Outlook mail client. Sound simple but, there is a “catch” in our scenario. 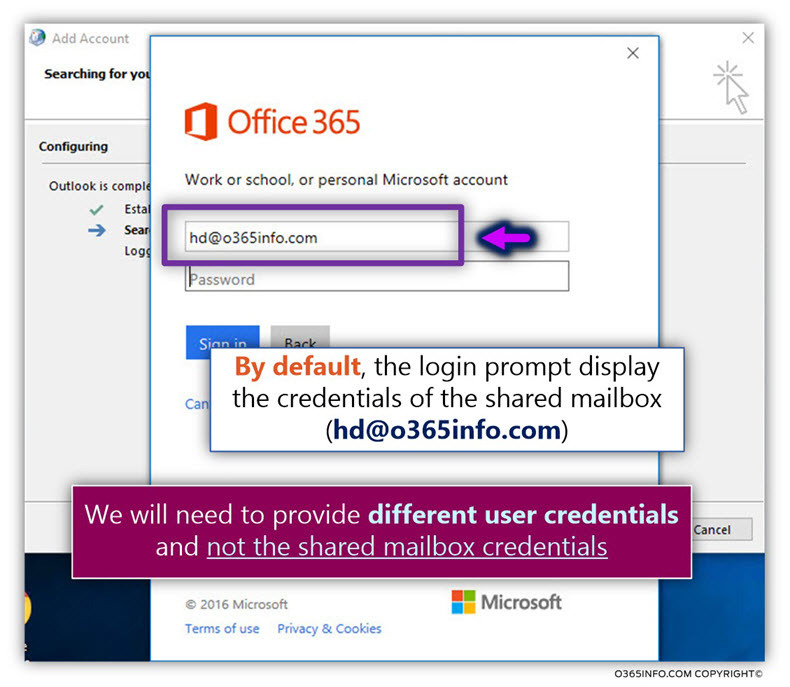 The shared mailbox is not “attached” to a standard Office 365 user account, and doesn’t have a “standard user password”. The shared mailbox is a special mailbox that doesn’t have a license, and the password is generated automatically by the Exchange Online. 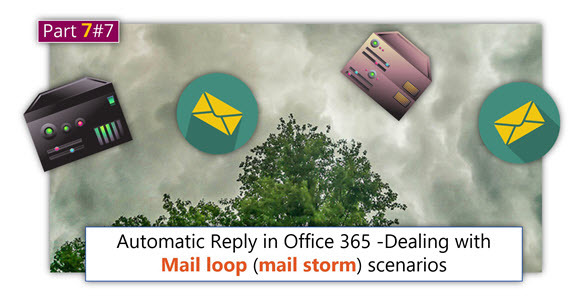 The problem that we are facing is – how can we create the required Outlook profile for the shared mailbox that will enable us to create the Automatic Reply mailbox rule? The solution to this problem is implemented by using a little trick. 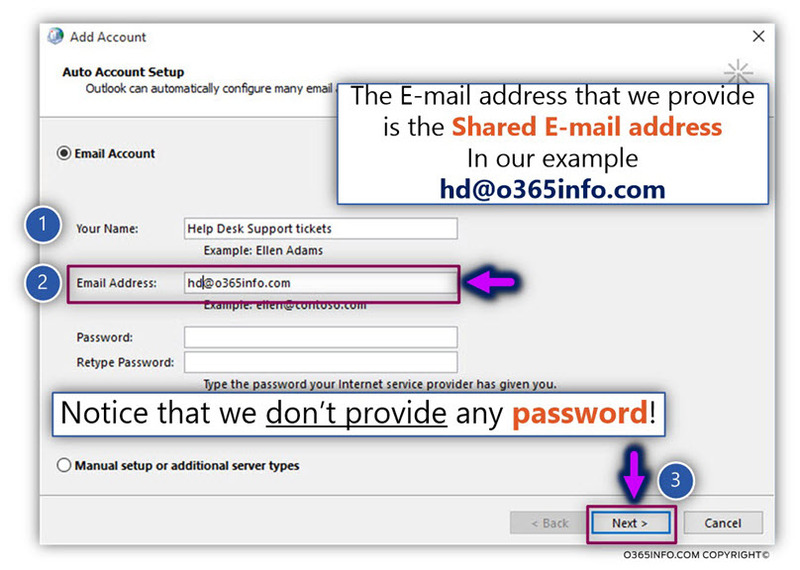 We will start to process of creating a new Outlook mail profile and provide the E-mail address of the “Help desk Shared mailbox.” We will not provide any user credentials in this phase! In the next phase, Outlook will try to complete the Autodiscover process, and we will need to provide the required user credentials. In our scenario, we will use the user credentials of Bob (Bob is a member of the Help Desk security group, and he has Full Access permission to the shared mailbox). 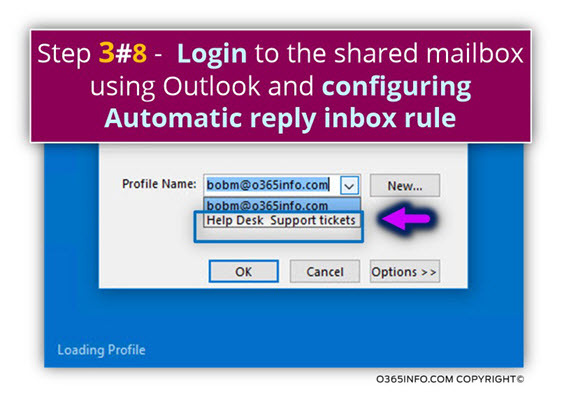 Technically speaking, we can use the option of OWA (the Webmail interface) for “log in” to the Shared mailbox for the purpose of creating a mailbox rule. The “problem” is that the OWA mailbox rule wizard interface doesn’t include all the options that exist when we use the Outlook mail client. In our scenario, we need to set mailbox rule that will trigger an Automatic Reply. This option doesn’t include when using the OWA mail client. Notice an important detail – we will not provide the password of the “Shared mailbox” recipient and if we want to be more accurate, we don’t know what is the password of the Shared mailbox user account. We will leave the “password box” empty. In the next phase, we will provide the credentials of an Office 365 user who have Full Access permissions to the Help Desk shared mailbox. We will not provide a password (because we cannot use and doesn’t know what the shared mailbox user account password is). A prompt window for user credentials appears. Outlook “assume” that the credentials we need to provide are the credentials of the Help Desk shared mailbox ([email protected]). 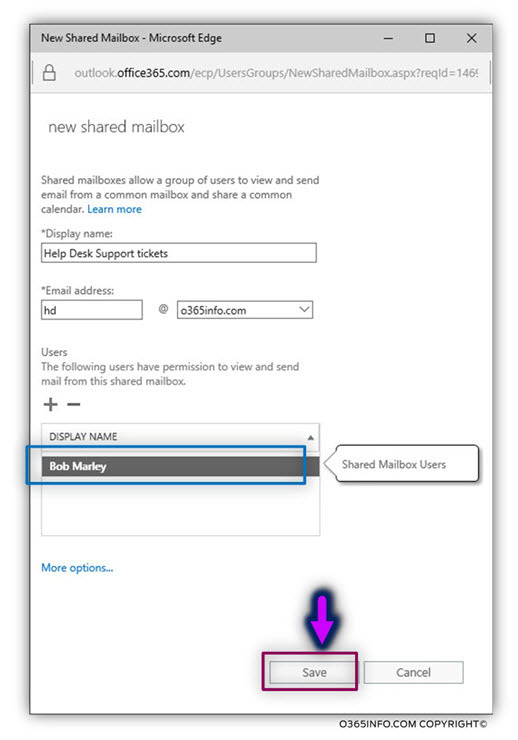 A quick reminder- in the former step, we assign Bob the Full Access permissions to the Help Desk shared mailbox. In the next screenshot, we can see that the process of creating the new shared mailbox outlook mail profile was completed successfully. 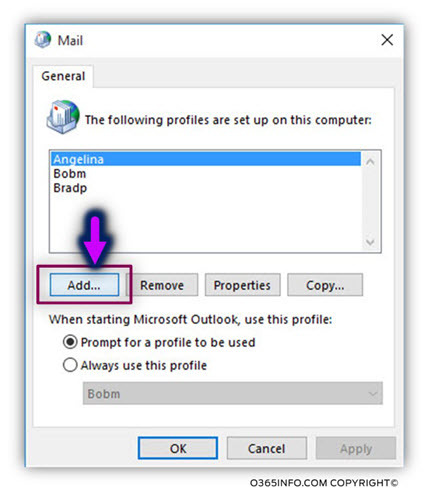 In case that the desktop that you use include a couple of Outlook mail profiles, select the option – Prompt for a profile to be used. The reason for selecting this option is, that because we want to log in, the Outlook mail profile of the Help Desk shared mailbox for creating the required auto response mailbox rule. In this step, we will create the required Automatic reply mailbox rule. A quick reminder – we want to create a mailbox rule, that will provide us the following requirement- each time that an organization’s user will send a service request to the Help Desk shared mailbox, the Shared mailbox will generate an Automatic Reply answer. 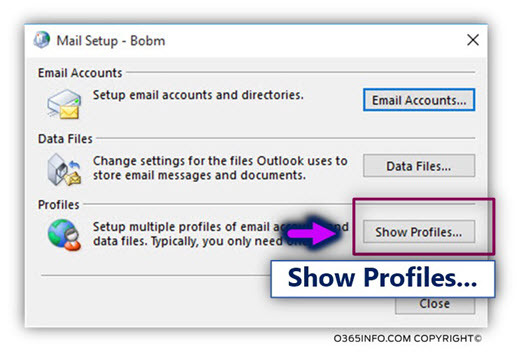 Open Outlook and choose the shared mailbox mail profile. 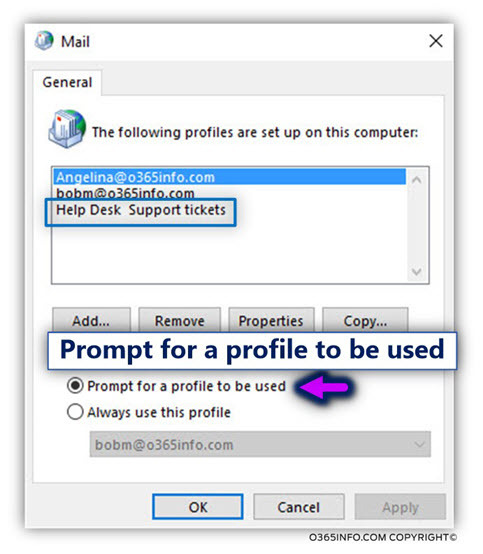 In our example, the mail profile is – Help Desk Support tickets. In the following screenshot, we can see that we “login”, to the Help Desk Shared mailbox ([email protected] in our scenario). In this step, we define the “mailbox rule condition”. In the “program language,” this is the part of “IF” (If a specific condition is fulfilled). This is the second part of the mailbox rule which can be described as the “What part”(the former mailbox rule deals with the “IF”). As a result, a “New mail” will appear. This is a mail template that will ‘contain” the Automatic reply content. Note – It is important to mention that the mailbox rule that we create considers as “server-side side rule”. 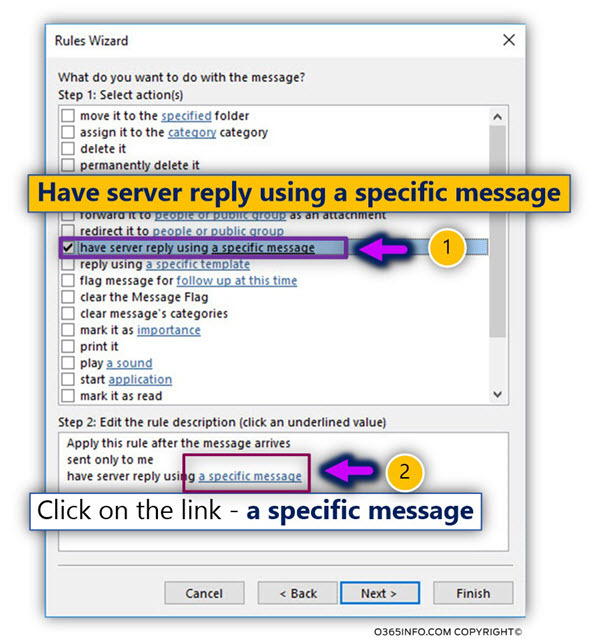 The meaning is – that the Automatic reply rule will be activated by the “server” (Exchange Online) without the need to open the Outlook mail client. In our example, I use a predefined text that I have prepared that include a signature, company logo, etc. All we need to do is just – paste the “content” in the “New mail template,” and to save the template. In the following screenshot, we can see that the update was saved. In other words, the Exchange mailbox rule “know” what E-mail template to use. In this step, we would like to verify that the Automatic Reply shared mailbox rule is operating properly. 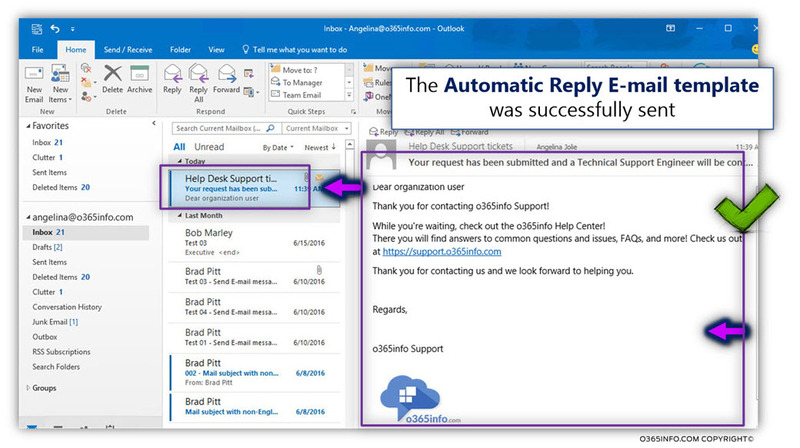 To be able to test the Automatic Reply shared mailbox rule, we will send E-mail to the E-mail address of the Help Desk shared mailbox, and see if we get the required automatic respond using the E-mail template that was configured in the former steps. To be able to simulate standard user communication, we will use the Angelina mail account. 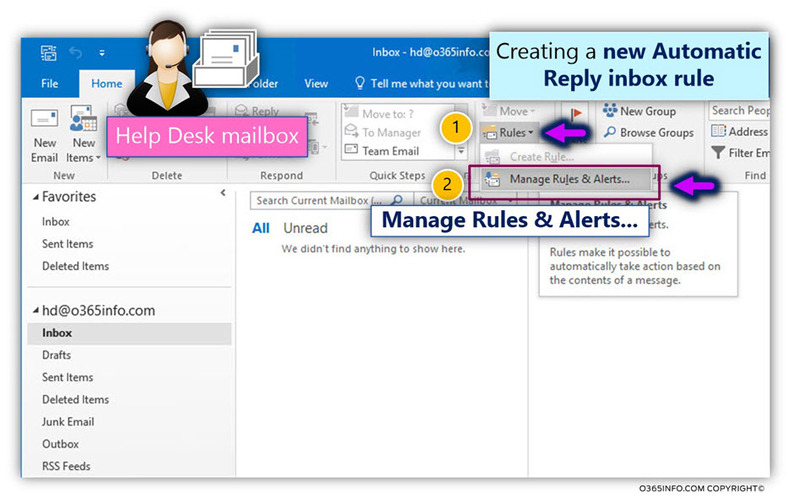 Open the Outlook and create a new E-mail. We will send the E-mail to the Help Desk shared mailbox. In our example, the E-mail address is – [email protected]. In the following screenshot, we can see that the Automatic Reply shared mailbox rule was successfully “activated”. 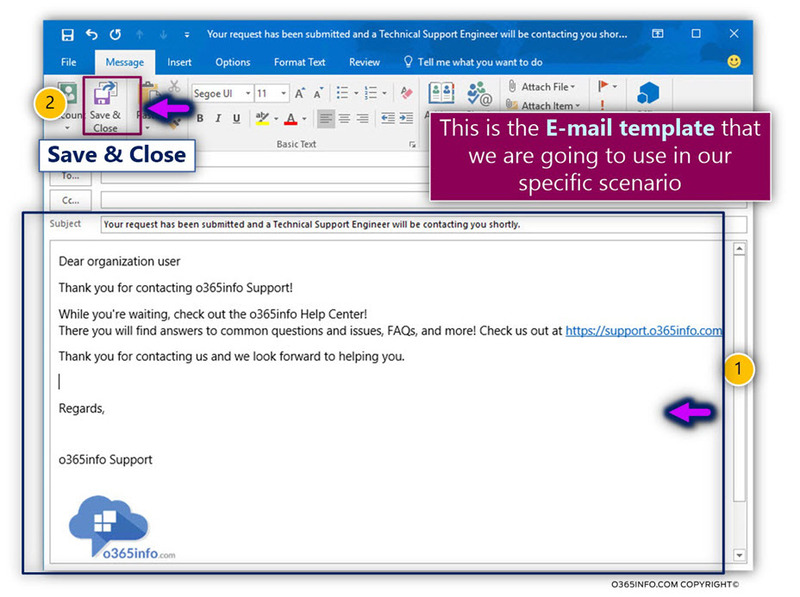 The Help Desk shared mailbox respond with the E-mail template that was configured. 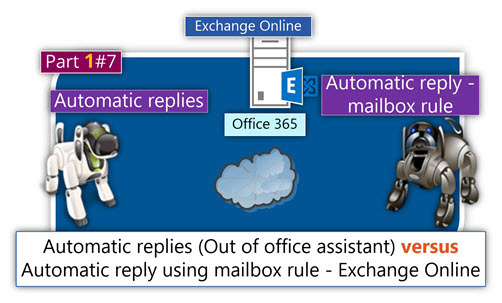 In the current article, we review how to implement a configuration of Automatic Reply by using Exchange mailbox rule.The mailbox rule engine is part of any Exchange mailbox. 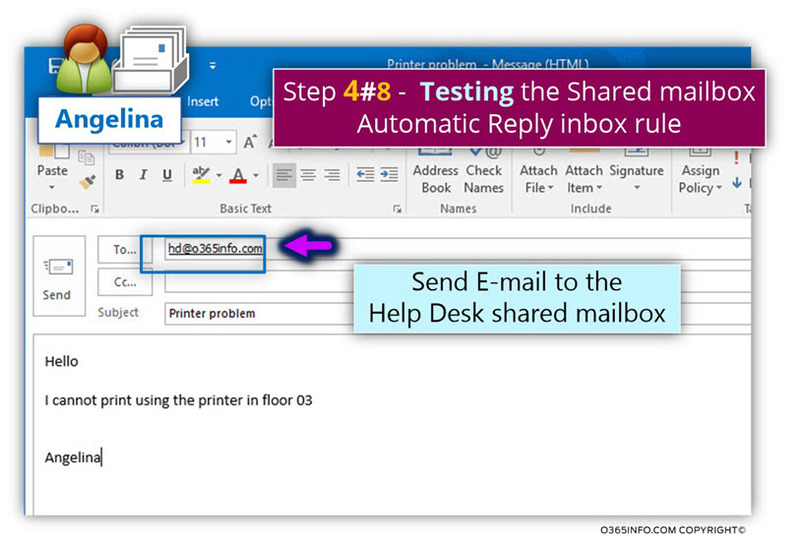 In our specific scenario, we will use a Shared mailbox that will serve a “service mailbox” for our Help Desk team. I have a question regarding this article. Why do you only select ‘sent only to me’? for his web page, because here every information is quality based information. There are a couple places in this article that references the job mailbox used in the post for Public folders and I think you mean hd mailbox for this post. 5.All of the Help desk team members, will have the option to “send as” reply using the email address of [email protected]. •Double-click on the Jobs shared mailbox. Does this rule get stored in Exchange Online? 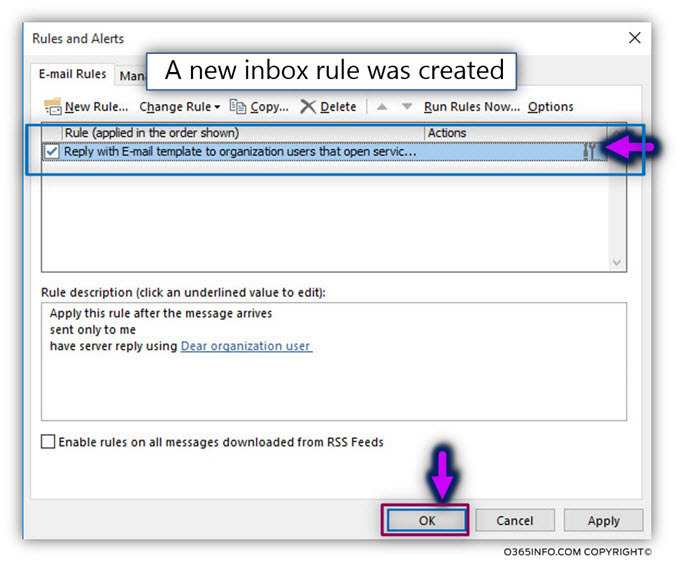 Or does the Outlook have to be always opend so that this rule work? I have configured shared mailbox(w/o license) to send auto reply.Its working fine,but when i used forwarding from this account then auto reply not working. How would this solution handle email loops? What if the original sender has a similar auto reply configured? This is precicely also my concern, I can’t safely use this method without confirming that a loop will not occur. This is great. Thanks so much!!!! Hi, This was great, Thanks. Same concern with looping. Right now I use Exclaimer on prem to handle auto responses and it works great and has loop detection because it knows it’s sent x amount in so many minutes or it stops responding. Wondering if Exchange has any built in protection. There exists a cloud service named Autoreply 365 Visit https://www.ivasoft.com/autoreply365.shtml for details. It is a very advantageous post for me. I’ve enjoyed reading the post. It is very supportive and useful post. I would like to visit the post once more its valuable content. Thanks! This does not work for me with Office 2016. Seems Loke Outlook cant discover the shared mail adress as a “User”. I dont come further the “Searching for Settings” Step.